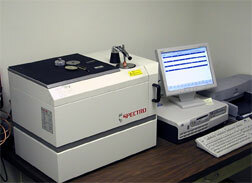 Chemical Analysis - Metallurgical Technologies, Inc. Surface analyses, chemical analysis and imaging on a variety of materials are performed using a Scanning Electron Microscope (SEM). The Scanning Electron Microscope is equipped with an Energy Dispersive Spectrometer (EDS), sometimes also referred to as energy dispersive x-ray analysis (EDXA). SEM/EDS provides elemental chemical analysis of the field of view or spot analyses of minute particles. EDS micro chemical analysis is performed by measuring the energy and intensity of the signals generated by a focused electron beam scanned across the specimen. More than 90 elements can be detected with our low-atomic number detector using the SEM/EDS method. This micro-chemical analysis is also a non-destructive test for samples that are of size to fit within the testing chamber. 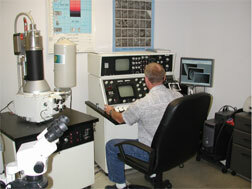 SEM/EDS is utilized during Failure Analysis, Corrosion Investigation and Contamination Issues. As an alternative to SEM/EDS, the Optical Emission Spectrometry (OES) technique utilizes a high-energy spark created across an argon-filled gap between an electrode and a sample of the material to be analyzed. The spark creates an emission of radiation from the excited sample surface with wavelengths characteristic of the elemental chemical composition. The spectrum of radiation is separated into the distinct element lines and the intensity of each line is measured. Finally, these are precisely converted into concentration values for each element present. Typical applications involve determination of the alloying content of iron and steel, aluminum, copper, nickel, zinc, lead and many other metals and alloys. 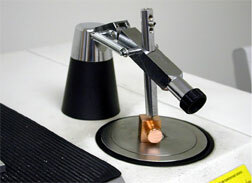 Optical Emission Spectrometry continues to be the reference technique for direct chemical analysis of solid metallic samples. The unmatched combination of accuracy, high speed, precision, stability and reliability have made it an indispensable tool for production and verification of quality metallurgical products. Determine cause of failure & recommend ways to prevent future recurrence. Determine cause of material degradation that reduces life expectancy. Verify fracture mechanism & initiation. Microstructure composition and imaging. Reveals grain structure, thermo mechanical processing & flaw and defect characteristics.